ALL SIGNS ARE NOT MADE THE SAME!! 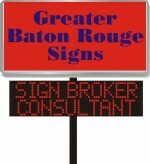 DO YOU KNOW THERE IS A DIFFERENCE BETWEEN ‘IDENTIFICATION’ SIGNS AND ‘ADVERTISING SIGNS’?? CHEAPEST PRICE OVERLOOKS QUALITY, DURABILITY, EFFECTIVENESS. Usually ends up being MORE expensive! !